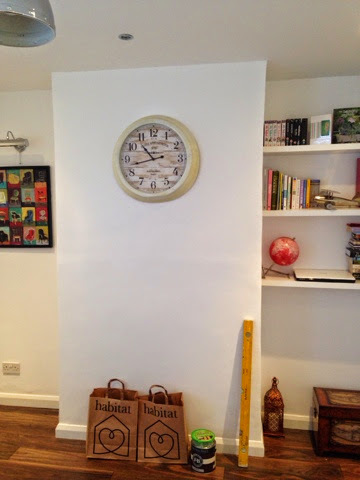 I have been having a bit of an autumn/winter makeover in my home and have finally got round to some DIY that I have been meaning to do for a very long time. It all started when my dad turned up one evening to put up my antique cast iron outdoor lamp....I suddenly remembered the huge mirror that needed hanging up, the hanging basket wall bracket that I wanted fixing, the door number wall plaque that I wanted affixed under my lamp...the list was endless, and with my dad and his power drill at my door, it was an opportunity not to be missed! The day after all of those items were kindly put up my dad, it kick-started me to start the bits I could do myself inside my home. When I moved in, I had just asked for all of the walls to be painted white as I did not want to make any quick decisions on colours before I saw how the rooms would work and feel. 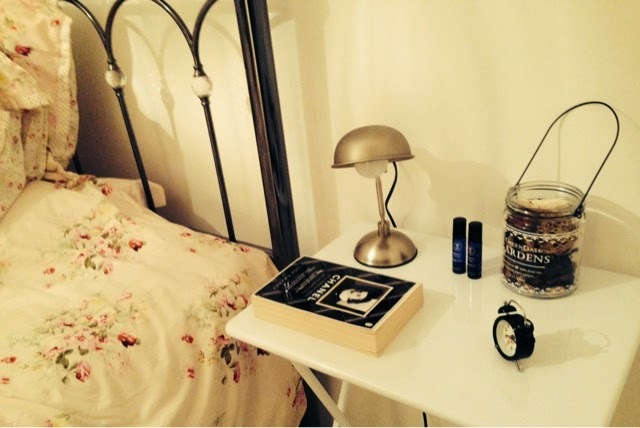 The only room that had any colour was my bedroom chimney breast that is painted in Fired Earth's Ultramarine Ashes - a gorgeous matte pastel sea-grey/green. 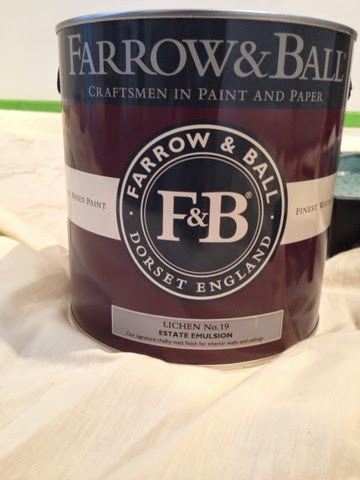 As well as Fired Earth, I have had a love affair with Farrow & Ball paint colours for a long time and am forever buying the small tester pots to decide which colour to go with. I love grey, green and duck egg blue colours. 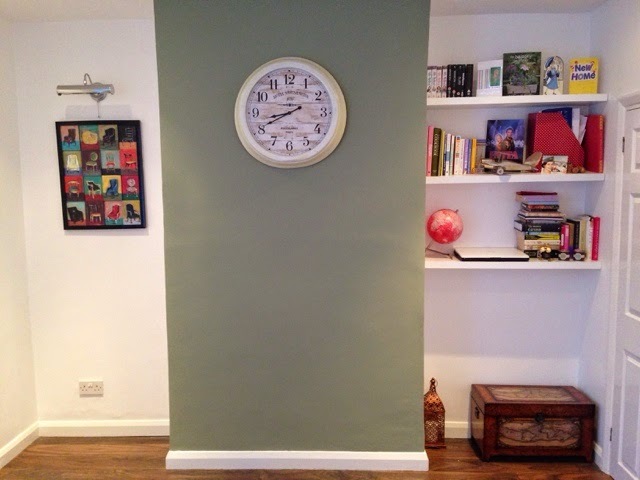 Their estate emulsion finish gives that modern matt look that is very flattering and very 'in' at the moment. 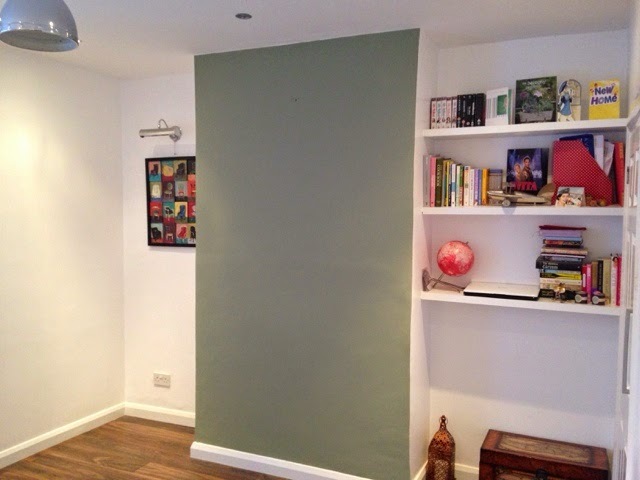 After much deliberation, I decided to paint the chimney breast in my dining room in Farrow & Ball 'Lichen' which is a matt olive green colour. It was a colour that I thought would go very well with the rest of the white walls and the walnut floorboards that I have. 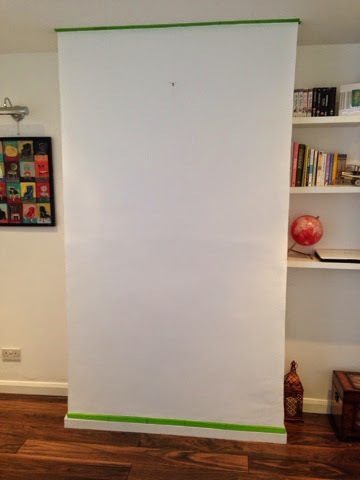 I brought some FrogTape for marking out the area that I wanted to paint, as I was just doing the front of the chimney breast and not the sides. FrogTape is brilliant for providing a barrier that seals the edges of the tape and stops paint from bleeding...even so, my heart was in my mouth when I peeled it away, scared that for some reason it might not work! 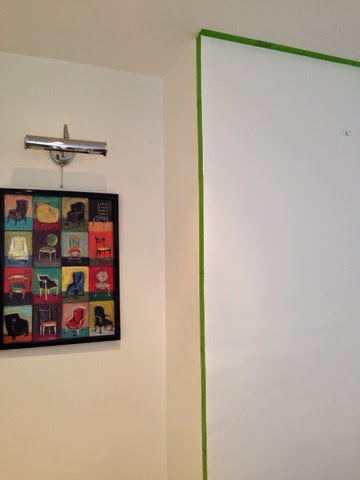 It was my first time painting anything in my home and it took me a while to get my flow with the paint roller! As someone who is very impatient and wants to always see results quickly, I really had to sit on my hands after the first coat to ensure that it had dried properly before applying the second layer. In total, I applied 3 coats to get the complete coverage of colour that I was looking for. The best thing that I noticed about F&B paints is that there is little odour!...I did not have to have any windows open or go through the ordeal of having that strong paint stench in the house. I could really see the quality of this paint also - the pigmentation is very high and even though I used 3 coats in the end (which was probably down to my technique more than anything) you could probably finish the job and be satisfied with two. I absolutely adore this colour and how it looks in my room!﻿ It has really brought it to life and added character by just highlighting the chimney breast feature and the matte effect is very cool and heritage looking. I am currently looking for a chesterfield armchair to put in the corner on the left (above) where I can snuggle up with a good book and a fluffy throw during the cold evenings and I think that will finish the look off nicely. I am going to follow through with this colour into my kitchen and paint two ceiling beams and my stable door in the same shade. I will share pictures as soon as I get round to doing this! I hope you all have a lovely weekend - let me know if you get round to any DIY too!